A 129-year-old mansion in Capitol Hill with pending cannabis licenses has hit the market for $2.25 million. The Creswell Mansion, a 4,300-square-foot building at 1244 Grant St. that dates to 1889, was listed in mid-April. The listing also includes a separate parcel, 1250 Grant St., which includes the 2,300-square-foot carriage house tucked behind the mansion. 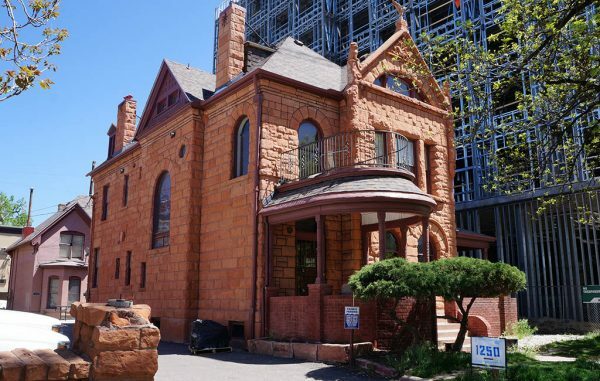 The home, originally built by a textiles baron, has been converted to office space. A portion of it is leased month-to-month to Shaw Construction, which is building an eight-story apartment complex next door. The site totals 0.28 acres. The two parcels are owned by 1244 Grant Street LLC, which bought them in May 2017 for $1 million, according to county records. Christopher Stefan, principal with Desarollo Real Estate, said the LLC consists of himself, IH Holdings and Vicente Sederberg, a Denver law firm that specializes in marijuana issues. Vicente Sederberg operated in the building from 2013 to early 2017 and exercised an option to purchase the property from the previous owner. Stefan said the carriage house is licensed as a medical marijuana center to an entity called MMRD, which has applied to convert that to a license that would allow a recreational dispensary. Stefan said he’s hopeful the recreational dispensary and social use licenses will be approved in the next 90 days. If they are, a new owner of the property could lease the two buildings to MMRD and Utopia, or attempt to buy the licenses from the entities, he said. “That’s really the vision here, is to make it a one-of-a-kind marijuana venue,” Stefan said. A property with existing licenses is particularly valuable, he said, because of Denver’s moratorium on applications for new dispensary licenses, as well as regulations restricting how close marijuana businesses can be to schools and daycares.